Convention videos are only available to AGA Members, so join already! 2008-2017 special, our last five conventions on five Blu-Ray or ten DVD. Physical media (DVD and Blu-Ray) are available from all our past conventions. In addition, selected talks from past conventions are available for streaming free to members, with a new presentation released each month. The 2017 convention is now complete and can be purchased either as online streaming ($20) or as physical media (which also includes online streaming for free). Each year’s convention comes in a slimline DVD or Blu-Ray case with a printed cover. All presentations feature the speakers miked directly into the camera, and the original images digitally inserted into the video (no shoot the screen garbage here!). Various pauses for accidental backwards slides and such have been removed. In the case of Mr. Amano's work, we've overlayed Tomoko Schum's amazing translation directly over his talking. Live demonstrations are 3-camera edits. Starting in 2008, all disks are presented in anamorphic widescreen and are also available on High-Definition Blu-Ray (really helpful for those slides with a ton of tiny words on them!). It's not perfect, sometimes the mic didn’t work right, sometimes the slides don't look that great, sometimes the third camera was whatever someone in the audience had brought ... but we're still pretty proud of them. Membership note: Due to an arrangement with our speakers, convention disks are only available to AGA Members. If you are not a member, you must join before purchasing a convention disk. 2017 includes Luca Galarraga's epic aquascaping demo edited down to an hour, presentations by Rachel O’Leary (inverts and nano-stocking), Bart Laurens (Dutch Aquascaping -- the full 2-hour presentation at GSAS, and the 1-hour version at the convention), Karen Randall (Sunken Gardens, and the banquet talk on how our plants go from discovery in the wild to our tanks), Ghazanfar Ghori (Bucephalandra), and Luca Galarraga (aquascaping competition). Also included are the micro-talks, the Wabi-Kusa demo and workshop, and nano aquascaping workshop highlights. 2015 features presentations from Rachel O’Leary (inhabitants for the planted aquarium), Tom Barr (two talks), Sean Murphy (basic plant botany and taxonomy), Phil Edwards (substrate), George Farmer (aquascaping), and Nick Klase (yes, including both parts of his talk). Most of the mini-talks are also included. The aquascaping duel will be edited to an enjoyable 40 minutes, and there is a highlights video of the nano workshop. 2012 Convention (2-DVD or Blu-Ray): Two talks from the World's foremost Cryptocoryne expert Niels Jacobsen, one technical on the Evolution and Variation of the genus; and one travelogue on Niels’ experiences in Southeast Asia. Two talks from Kris Weinhold, one for beginners, one for more advanced aquatic plant keepers. Brandon McLane from Florida Aquatic Nurseries surveys the methods of Propagating Aquatic Plants. Tom Barr embraces the balance of CO2, light and nutrients. Cavan Allen goes exploring for North American Native Aquatic Plants. There's also a 7-minute edit of the Nano Aquascaping Workshop, a panel Q&A, and the presentation of the Aquascaping Contest awards. All talks are 2-camera edits, and in some cases the slides have been cleaned up better than when they were presented live at the convention! The 2010 Convention (2-DVD or Blu-Ray): Claus Christensen asks the question Are your growing conditions ideal? And do you care? , gives us some hints on shipping plants and acclimating tissue culture samples, and takes us on a tour halfway around the world. Dr. Mike Kane gives a lecture on amphibious plants, and a tissue culture workshop. Watch the AGA's best stick sterile samples into little jars! Karen Randall presents on aquascape design principles. 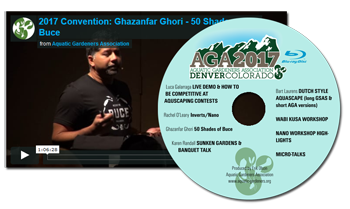 Ghazanfar Ghori teaches how to grow emerse Crypts, and Jason Balian talks about aquascape photography. We've also got a 3-camera edit of the Iron Aquascaper competition (sponsored by ADG), and a 9-minute highlight reel from our tour of Florida Aquatic Nurseries. 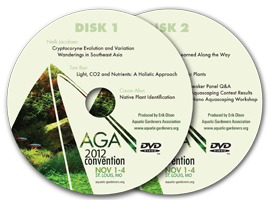 Our 2008 convention (2-DVD or Blu-Ray): On disk 1 you'll get all the lectures (Dr. Morin on Iron Uptake, Dr. Kane on tissue culture, Dr. Tan on mosses, Dr. Amano and Dr. Senske on aquascaping, and Dr. Randall on collecting in Thailand). On disk two are the two live events: the Iron Aquascaper, the Amano aquascaping demo, both 3-camera edits. We've also tucked in the Aquascaping Contest awards -- in total, over nine hours of stuff to watch! 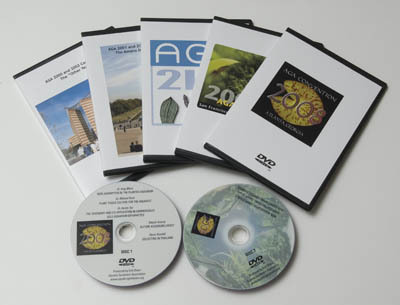 The 2006 Convention (2-DVD set): Ole Pedersen (aquascapes in nature), Troels Andersen (acclimation of plants to underwater life), Eric Do (shrimp and other invertebrates), Dorothy Reimer (growing it old-skool! ), George Batten (Chemistry), Ricky Cain (Inspiration), and Jeff Senske (aquascape photography). Plus the traditional aquascaping contest awards, and the first-ever Iron Aquascaper Competition, filmed with three cameras and edited to 45 minutes. The 2004 Convention includes Jan Bastmeijer (Crypts in Nature, and Emersed Culture), Takashi Amano, Diana Walstad, and Mike Senske. The disk also includes Mr. Amano's late-night aquascape demo, edited down from two hours of three cameras to a blazingly-quick 45 minutes. And we barely crammed in the aquascaping awards. The other two workshops had very poor sound, and are included only as low-bandwidth computer-playable AVI's. The 2003 Convention (2-DVD set): On disk 1 you get the main talks (Christel Kasselmann, Shaun Winterton, Roger Miller, George and Karla Booth, and Karen Randall), and on disk 2 another five hours of focus groups, banquet and miscellaneous talks, plus a bonus behind the scenes featurette that we challenge you to actually find! The 2002 Convention has two presentations by Claus Christensen (including a collecting trip in Brazil), talks by Jeff Senske ( Commercial Aquascaping ), Chuck Gadd ( Plants: Nature's Test Kit ), Erik Olson ( Photography and the Planted Aquarium ), and Don Kingore ( Kent Botanica ) and panel discussion. The 2001 Convention includes Takashi Amano's Nature Aquarium talk and live aquascaping workshop (first time in the US! ), Wim van Drongelen speaking on the Dutch aquascaping style, Greg Morin of Seachem, Tom Barr, and Todd Stailey (photography). There's also a panel-audience question and answer session. The 2000 Convention features talks by Neil Frank, Paul Krombholz, David Lass (lighting), Charlene Nash on Public Aquarium Planted Displays, and Karen Randall (plus the entire AGA membership in attendence) on Plant Nutrition. We crammed a few convention photos and program notes into the DVD-ROM portion of the disk, and there's another little featurette hidden somewhere as well. Note: the production values on this disk are significantly lower than the others, because in 2000 everyone was still using 35mm slides, and this was our first convention. You do not have to have a Paypal account in order to use our system. If you do not have a PayPal account, or if you prefer not to use it, simply enter your credit card information on the checkout page. If you have a PayPal account, but prefer not to use it, enter a different e-mail address than the one PayPal has on file.